So after spending everything I had and borrowing a lot of money to have Toto's surgery, I didn't have any left for all the extras like harness, dog shoes, stroller, wheelchair, etc, so I have been making them myself. Well, the shoes I bought but they were crap and didn't last a day, so I also made those myself. Stroller: hey, its embarrassing whether its a dog stroller or baby stroller. You get used to the strange looks and stupid comments. I found an old toddler stroller that someone had thrown out. It was a mess but with a bit of washing, was usable. Toto's dog bag fit right in. If you don't have a dog bag, use a sports bag with a piece of wooden board for the bottom and a few blankets piled up over it. Dog Back Leg Harness: I looked around and the new ones cost about 50 dollars. At first I used a scarf, but I worried that it put too much pressure on his bits. One day after using it, we had to have a catheter set again because he wasn't peeing. So I decided to make one. I hand stitched it (with my pretty much non existent sewing skills) and it has held up perfectly for about a month now. Toto is about 22 pounds (10.5 kilo). So this definitely works for a dog his size or smaller. Roll it up, starting at the wider end. Toto's shoes are made of leather and shaped to his feet, then hand stitched: drew his foot on some paper, increased the size by about half an inch, doubled it on leather, stitched it. To keep them on I use Velcro. The toe stitches were opening up a bit so I wrapped duct tape around the toes to prevent them from coming undone. They've also held up over a week now. Before I was using socks and they lasted a day or two at most. The store bought ones didn't stay on at all. I have not posted here in forever because so many things have been going on, but I though this was something I should share, just to help others dealing with the same issue. About 2 months ago, my happy, active 5 year old mixed breed dog suddenly started experiencing severe pain. I came home one evening and he was really stiff and would squeek when I pet him (Friday). I thought he had eaten something bad and was bloated, so the next morning, when he didnt improve, I went to the vet. She said it was a slipped disk. She gave him a shot of pain medicine and sent us home. Toto seemed better that day, but in the evening he got worse and the next morning I took him to an emergency vet. We spent most of the day there. They said it could be stomach or back, and I had sort of a choice between treating "cholera or the plague," (her words). So thinking that if he had stomach blockage, he could die, I decided to have them treat that. I think he was given a shot of antibiotics. He improved that day, but got worse again the next. I think I had to go back anyway either for another shot or another check up, saw a different vet, they said it seemed to be definitely stomach, and sent me home with another shot of something. At some point he got an xray, which showed gas in stomach and intestines, 2 calcified disks and spondylosis. I think tues I went back and toto had a stomach ultrasound. They found nothing. 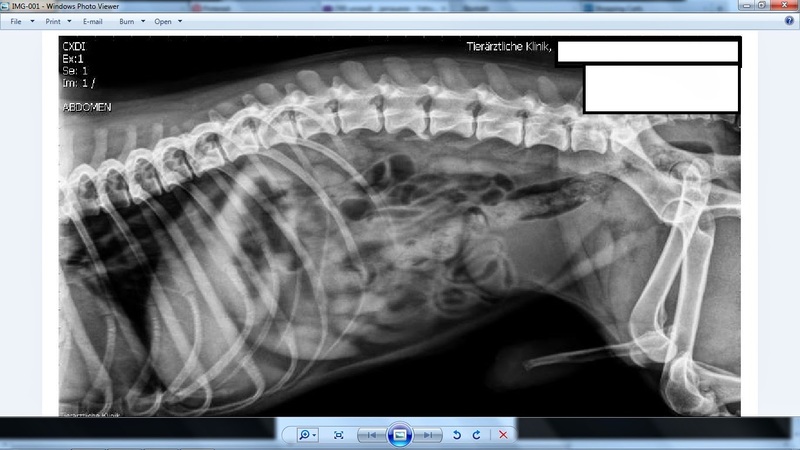 This vet (again different vet) said it was definitely slipped disk. At that point I demanded a blood test. It came back positive for pancreatitis. His levels were seriously high: 800 with anything over 400 being pancreatitis. So they gave him a shot for that (antibiotics) and I was to come back the next day for another shot. Toto was great the rest of the day. I took him for a walk and he was very active and happy. He didnt run and play, just walked normally for the first time since it started. Thursday, on our morning walk, toto made a quick movement when he saw another dog and completely froze up. He was in severe pain and I had to carry him home. I went immediately to the vet and they said definitely slipped disk and gave him pain meds. They told me to get an mri, but since they didnt have a machine, I had to go to another vet. That afternoon I drove to the other vet. They were convinced it was just severe pancreatitis and that an mri was unneccessary, but they checked toto anyway. Now toto was doped up so they had to put a lot of pressure on his spine to get a response. But since at some point he did squeek, they decided to go ahead with the mri. His mri showed a slipped disk, but they told me to go home and wait to see if it gets worse. The next morning, toto was paralyzed. He still had deep pain sensation, but couldnt move his back legs. This happened exactly one week after he first started having symptoms. So we went back to the vet immediately and toto had emergency surgery. I picked him up the next morning and took him home. He was too tense to allow me to express his bladder, so I had to take him to a vet again to empty it with a catheter. On monday it was the same, so again to the vet for a catheter. Monday afternoon we went back to the operating vet and they decided to keep him there to set a permanent catheter. Wednesday the vet called me saying that toto had lost deep pain in his back legs and was getting worse. They did another mri and then emergency surgery again on Thursday. Apparently some disk material had been left behind and caused further damage to his spinal chord. Now the prognosis was not as good as it had been before, because after loss of deep pain sensation, a dogs chance of recovering completely are much lower. A few days after the surgery toto still didn't have deep pain sensation and couldn't move anything. However, on Tuesday when I picked him up, Toto wagged his tail for the first time. It has been about a month now since the surgery and toto has continued to make progress. He can move his legs and is regaining muscle. He cant walk more than a few steps without falling over, but I think that's more of a balance issue. He can also express his bladder and bowels on his own. I built a little harness to hold him up in back to help him walk. It makes walking him almost normal, except that controlling a dog from his back end is a bit tricky. Otherwise now he's happy, healthy and pain free. It wasn't always easy, especially when he first came home. He couldn't control his bladder or bowels and he would just pee everywhere. I couldn't leave him alone because he was so anxious and would bark the whole time, so I had to take him around with me in a baby carriage. Now I can leave him alone for a few hours. He can also walk for long enough now (with support) so that I can take him out with me to do grocery shopping, etc. If this has happened to your dog just know that it does get easier and there are many options, even if your dog is completely paralysed. There are support groups, dog wheelchair suppliers, etc. Right now I'm working on a diy wheelchair, just to give him more mobility. It is made out of aluminum tubing. Started a new blog for all metalsmithing addicts at www.metalsaddict.com. It will feature free video tutorials, process pictures, technique descriptions and a lot of other metalsmithing related stuff. Please check it out if you get a chance and share it! ok, here's my most recent piece. I wanted to make something special for my mother for xmas, since she's done so much for me. She's been completely supportive of my love for making jewelry, which I'm totally grateful for. This necklace is sterling with orange sapphires and yellow and orange citrine stones. Hope she likes it! My friend Juliette, (her blog is here) introduced me to etching copper and I've been having a lot of fun with that lately. Because of the high cost of silver, I've been using much more copper in my work and etching is a great way to give the copper a unique design. It's been a long time since my last post. I've been busy moving in, setting up my room, making jewelry and taking care of my two dogs. I have not posted any new jewelry on etsy in a while, but I have been making a lot of new work and sending them to shops. The pace in Novo Mesto, Slovenia is a lot slower than that of the bay area, california, but I really like it. The city is very green and surrounded by lush forests. Every day I walk the dogs by the river Krka and just enjoy the beauty of nature. I enjoy watching the ducks swim up and down the river, and sometimes follow us on our walks. They guard the river bank and protect their young. The ducklings duck under water and swim a few yards under the river's surface when they feel threatened. There are cats everywhere and Toto has started chasing them up trees as a game. The river changes color almost daily, from a deep blue to grey, green and brown. Sometimes its covered in a thin mist, which gives it an almost mystical appearance and reminds me of medieval tales of mermaids and swam monsters. The people of Novo Mesto are very warm and welcoming. Most of the younger people speak almost perfect english, which makes living here much easier, as communication isn't a problem. The house I'm staying in is in the city center. It is huge and has a bar and stage for concerts, a gallery for art exhibitions, 2 music studios and a few artists studios. There are 2 painters, a few ceramics artists and myself, along with 3 bands that use the music studio's to practice. For those of you who don't know, I'll be moving to Slovenia the first week of september. Why slovenia? Well it's a beautiful country that just joined the eu, and I have friends there who have a sort of communal artists house and they've allowed me to come and stay. I'm an eu citizen so living there will be no problem, legally. Also I really love the idea of living in a community of people with common interests. We can be inspired by each others creative energy. So I'm very excited, but also stressed because of all the stuff I need to do before the move. I've put all my etsy shops on sale for now because soon I'll be putting them all on vacation mode. Obviously there is internet in Slovenia and otherwise nothing will change. I'll keep making jewelry and cutting stones and keep in contact with the online jewelry community. I'm just changing location. For those of you who know me well, this is no surprise because I move every 2 years or so anyway. I wish I could stay in one place, but somehow it just doesnt suit me and I'm always on the move again before I can settle down.